Even though newspapers have lost nearly half of their ad revenues in the last five years, some analysts believe they still are getting three times more advertising than their readership deserves. In a report released last week, eMarketer compared the amount of time consumers spend accessing various types of media with the percentage of advertising dollars spent on each format. Television, for example, represents about 43% of the time Americans spend consuming media and broadcasters collect about 43% of the advertising dollars, according to the study. So, that sounds about right. Newspapers, on the other hand, are pocketing three times more ad dollars than their mindshare would seem to justify. Even though consumers spend barely 5% of their time reading newspapers, eMarketer found that publishers are getting 17% of the ad spend. As you can see from the table below, the situation is the same for magazines. Because the allocation of ad-market share is a zero-sum game, print has to be benefitting at someone's expense. And two notable victims, in this case, are Internet and mobile advertising. In the most egregious mismatch discovered by the study, only 0.5% of advertising goes to mobile phones even though people spend more than 8% of their media time using them. With 25% of media mindshare devoted to the Internet and barely 19% of ad dollars going to the web, it is being shortchanged, too. This is good news for newspaper publishers because it proves that they have done an excellent job to date of convincing marketers of the value of their medium. As such, they have been able to corner a disproportionate share of advertising in comparison to other media. It also is bad news for publishers, because it represents a formidable threat: What would happen if advertisers began to wonder why they are spending so much on newspapers when they can use cheaper and more targetable advertising to reach the growing audiences on the web, mobile and social media? In reality, of course, the answer is known. Newspaper sales fell from $49.4 billion in 2005 to $25.8 billion in 2010. Despite a modest economic recovery that has increased ad sales for most other media, publishers anecdotally report that sales in the first quarter of this year were softer than they were a year ago. If publishers can’t catch up to their digital competitors, the staggering erosion in newspaper advertising in the last five years could be the prelude to something worse. 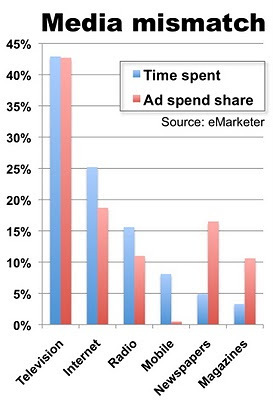 Designating media spending in proportion to time spent seems to me to be just about one of the shallowest strategies one could follow -- especially for bread-and-butter local advertising categories like retail. I would not be surprised to hear someone say that media budgets are mis-allocated in relation to more substantive bases like various effectiveness metrics. But relative to time spent? Who cares? Alan Mutter with due respect to your accomplishments, I also read the by e-marketer and found that your observations excluded one key factor about the consumption of information in our society today. News is consumed across multiple platforms and most if not all newspaper media companies operate traditional web sites as well as mobile sites. In aggregate the time spent per day with news media is 38.3 percent while ad spending share equals 35.25 percent-quite a different picture. Yes, news media is a great value for advertisers, this is the reason they return to us time and time again. In general, this is very interesting take on the industry. Bizarrely stupid metric. But let's say we take it at face value. In print or on the Web, ads and editorial share the same space. On television, they don't. The 43% of time watching TV collapses to less than 8 minutes a half-hour watching ads... and the average is even less, because many popular TV venues don't take advertising. Actually, this sounds about right. Time spent vs. ad effectiveness is a pretty crude measure. Bridal magazines are probably off the charts on this measure. But if you could display advertising on my pillowcase, it would probably earn paltry revenue per hour spent. The big issue with online and mobile is that -- unlike radio, TV and print -- these media have multiple use cases, some of which lend themselves to effective ad impressions, and many which do not. I agree with Gregory, this does not really reflect where content is consumed or where it originates. The other factor is the platform for mobile advertising is very new and still emerging and traditional advertisers have not yet embraced it. That said...The ad dollars will continue to migrate from newspaper and magazines to both internet and mobile venues even if this study's metric is not exactly accurate. I agree with eMarketer. The money that can come from newspapers and magazines over the years can fund many free mobile apps. Time spent with media does not necessarily translate to engagement with advertising. Consumers look to avoid ads in most media, but welcome them in print. That's why newspapers have held on to a greater share of ad spend... They still move product for advertisers. I am certain that e-marketer has absolutely no interest in promoting electronic media over newspapers...or any other media, for that matter. Newspapers are the easy target at this point. Being that 90 percent of the time people spend online in on Facebook and Google, one probably doesn't need a service like e-marketer to tell them where to advertise, now do they? Don't forget fragmentation of the TV and online audience compared to the concentration of the newspaper audience. Chances are, the person reading the newspaper is reading a local newspaper--THE local newspaper. Those people watching TV and surfing could be on any of hundreds of channels and thousands of websites. Where would you advertise? This is the strength of the printed newspaper, especially if it is complemented with a compelling website. With all due respect, that metric is a red herring. It has nothing to do with how advertisers spend their money. As a simple hypothetical: Compare a busy executive with someone who is unemployed. The unemployed person would spend a lot of time with media while the executive would spend comparatively very little. Who would you pay more to reach? Although a bit contrived, this example does reflect some reality. Advertisers do pay more for light media users (one reason why sports programing commands a high premium). My dear Mr. Mutter, perhaps those long-ago days of setting type fried some of your analytical skills. I was an editor myself and am much more positive about the newspaper industry (perhaps because I missed the linotype era by three years.) It seems that you and the folks at eMarketer have unwittingly mixed up time spent with media with the value of that media. It's the classic "mass media" mentality that people carry over to the Internet: More traffic means more money. It's actually inverse -- exemplified by the fact that the Yellow Pages industry gets $11.3 million per minute of usage while TV gets $400 million. If that's hard to comprehend, think of the value of reaching someone opening a yellow pages book, versus the value of someone watching "Jersey Shore." A newsosaur might think it's all about news, but you're forgetting the more important "news" in newspapers -- the ads. In fact, the Top 5 local online companies have all-advertising content. No offense, but I am growing weary of news consultants who glom to research that indicates the newspaper industry is doomed. It is not. "The staggering erosion in newspaper advertising in the last five years could be the prelude to something worse" is a true statement, but only if you added "...for those who stop believing in the value of the newspaper audience." So maybe we compares apples to apples here...compare local advertisers sales results in ad campaigns run in newspapers and on-line. Bet the newspaper leads directly to more sales than anything on line and by a wide margin. It's all about results. Sorry, I must have mistyped those figures in the earlier comment.... the correct figures are: Advertisers spend $113 million per minute of media time spent with the yellow pages, versus $400,000 per minute of media time spent with TV. Time spent with yellow pages is more valuable to an advertiser than time spent with a mass medium like TV.